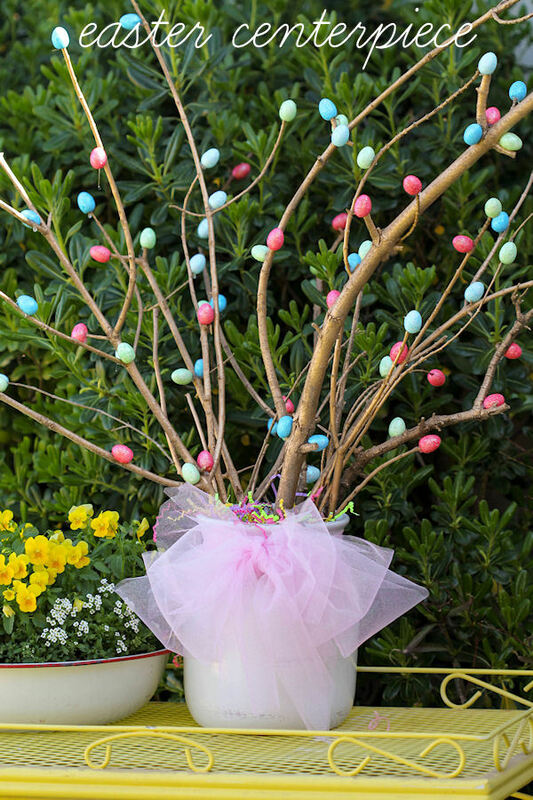 In the northern climates we get frost, in Fall and in Spring, and we get snow, and we have a shorter growing season. 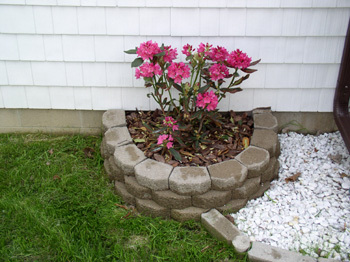 One way to extend your growing season is to protect your plants as much as possible. 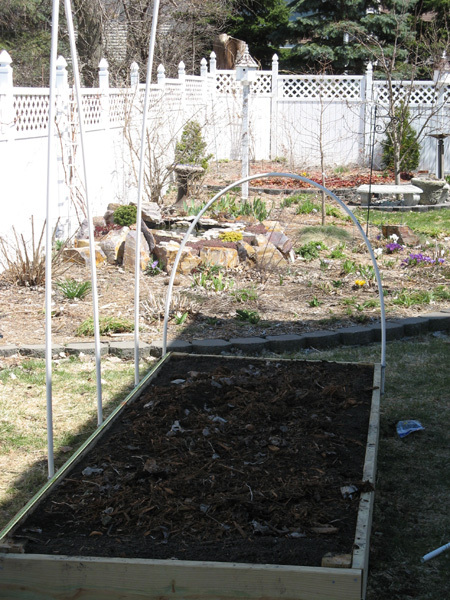 You can build a greenhouse, which is expensive, or a cold frame, which is cheaper but still expensive, but for relatively little money you can build a plastic hoop house. 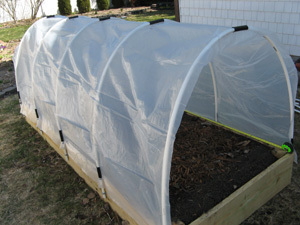 A hoop house will hold in moisture, allowing you to better keep plants moist and germinate seeds, just like if you were using a covered seed starting tray. It will also provide a few degrees of frost protection, if that is all you need, you will be all set. For this article I’m going to use the most recent bed I completed as an example. I put two 10×4 wood raised beds on the side of my house. 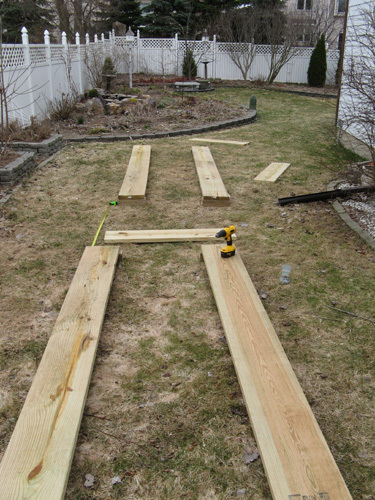 For instructions on how to build a wood raised bed, see this article: How to Build a Raised Bed Vegetable Garden out of Wood. You will want one rib at each end of the bed, as well as one every two feet down the length. So, divide the length of your bed by 2, and then add 1. So for a 10 foot bed I needed 6 ribs. You can attach the ribs using pipe clips, little half circle plastic or metal clips, to the outside of the wood. Or you can pound short rebar stakes into the ground on each side and slide the pipe over the stakes to secure it. Either way works. If you use the pipe clips I’ve found you need two to each side, so four total per rib. Attach all your ribs to one side of the bed, then go to the other side and one at a time bend them town to attach them to the other side. At this point your frame is done. Pretty easy huh? 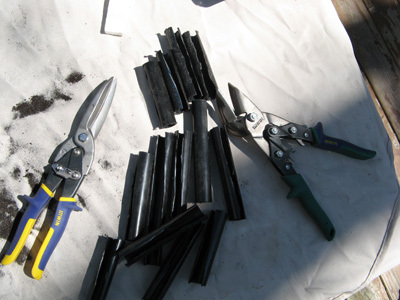 Take your black polyethelene flexible water pipe and using the snips cut it into 4 inch lengths. Then again using the snips cut a 1/4 strip out of each length going on the long way. This pipe should then easily slip over the PVC ribs, like a glove, snapping on and snapping off. The goal here is to make a clip or fastener that will not puncture your plastic sheeting, this method accomplishes that. This is also why I had you get the black pipe slightly larger than the PVC. 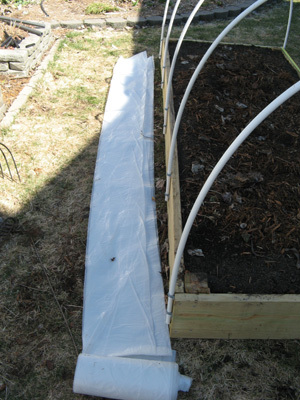 Lay your plastic sheeting on one side of the bed, at this point it may be good to have someone helping you, and lift it up and over, draping it along the ribs. Even it up on your side and attach the first row of black pipe clips you made, at the lowest possible point. Then another foot up, and another foot up, and at the apex, and so on down the side. Do it for each rib, keeping it even. Take the left over plastic and attach it to the ends by removing the clips from the end ribs, laying up the plastic, and reattaching the clips. You can then trim off any access with scissors. 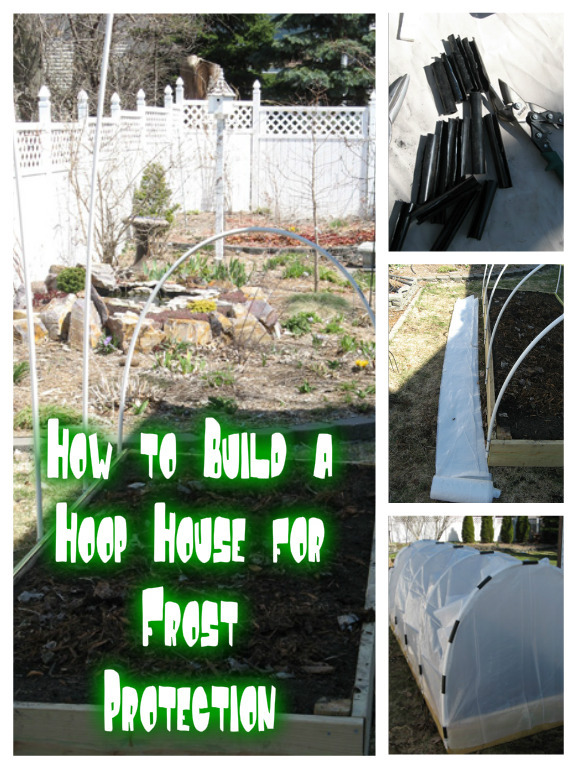 Your simple hoop house is now done. 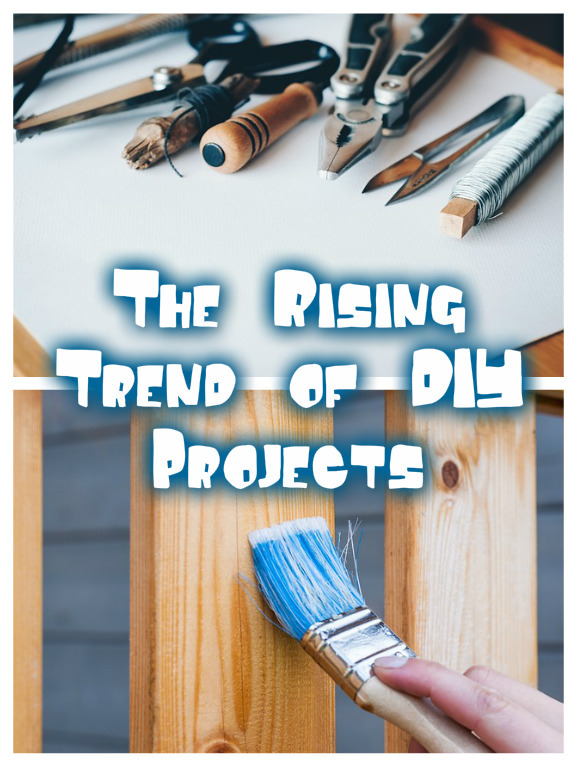 You should be able to relatively quickly put up or take down the plastic as needed. 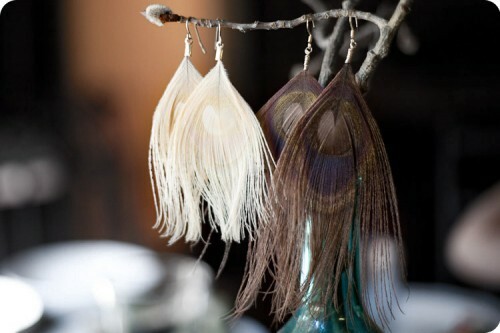 When it will not be needed for a long period, such as in the heat of summer, you can take it down and store it. 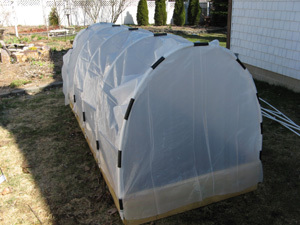 The ribs can be left up year round In addition to holding up the clear plastic, they can hold cloth to provide shade if you’re growing something like lettuce in the heat of summer, or netting to provide protection from bugs or birds if you’re growing a plant that needs such. 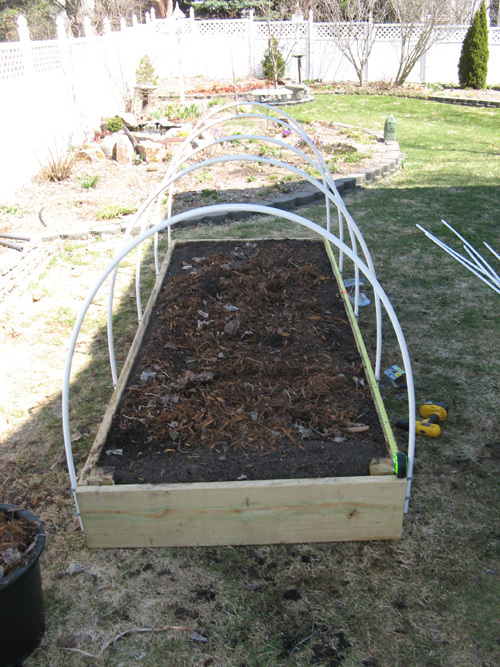 Finally, the hoops can be used to provide support to vining plants like cucumbers or even tomatoes. Four uses for your hoops. One optional improvement you can do is put a support running along the length of the top of the hoop, by screwing another length of pipe, long ways underneath (it has to be under or it will hinder the attachment of the plastic) the apex of each rib. But I found it not to be necessary.